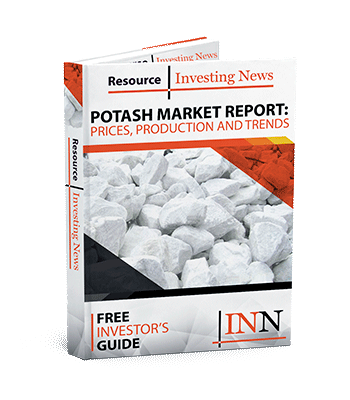 Interested in potash investing, but not sure where to start? Here’s what you need to know about potash, from supply and demand to prices to stocks. The world’s population is increasing rapidly, and is expected to reach over 9 billion by 2050. A larger population will have many consequences, one of which is that much higher amounts of food will be needed. But with more people will come further urbanization and less farmland to work with — that means farmers will have to increase crop yields. That’s where fertilizers like potash come in. They not only provide essential nutrients to food, but also allow higher output from farms — put simply, fertilizers improve water retention in plants and strengthen their roots and stems, allowing them to produce more food. Unsurprisingly, many investors are wondering what potash investing is, and how they can get involved in this exciting space. Read on to find out. Potash investing: What is potash? First, it’s important to understand what potash is: an alkaline potassium compound that is most commonly used in fertilizers. All in all, 95 percent of the world’s potash supply is used to grow food. The term “potash” refers to potassium compounds and potassium-bearing materials. It includes potassium chloride (KCI), which is a salt-like mineral that is naturally white or colorless, but sometimes takes on a pink or red color due to impurities such as clay. Most potash comes from salts left over from ancient evaporated seas, which lie underground. There are two different types of potash: sulfate of potash (SOP) and muriate of potash (MOP). SOP is used on high-value crops, such as fruits, vegetables, nuts, tea, coffee and tobacco, and is considered premium quality. MOP is more common, and is typically used on vegetables such as sugar beets, celery and Swiss chard. According to the US Geological Survey, global potash production capacity is expected to reach 65.5 million MT by 2021, a large increase from the 59.9 million MT produced in 2017. Last year, the top potash-producing country was Canada, whose output came in at 12 million MT, an uptick of 2 million MT year-over-year. Saskatchewan is responsible for 90 percent of that amount, and accounts for about 50 percent of the world’s supply. Canada was followed by Russia, which produced 7.2 million MT last year, and Belarus, whose output totaled 6.4 million MT. As it stands, there are only 12 countries currently producing potash. In terms of demand, the US Geological Survey says that world potash consumption is expected to grow to 45.6 million MT over the next three years. In 2017, world consumption clocked in at 42 million MT. China, India and Brazil are the three largest importers of potash. The potash space has suffered from oversupply in recent years, and that has created lower prices and put pressure on potash companies. That said, the 2018 potash outlook looks fairly promising, and as noted population growth is expected to spur even more demand for potash in the long term. Given the solid outlook for potash, many investors are interested in entering the space. One popular way to do so is by investing in potash stocks. There are a huge number of companies to consider, so it’s important to do your research. Our lists of potash companies on the ASX and TSX and TSXV are good places to start. This is an updated version of an article first published by the Investing News Network in 2016. Don’t forget to follow us @INN_Resource for real-time news updates. Attention Investors: Potash prices are at a new low. Could this be the perfect buying opportunity? Get the latest information about companies associated with Potash Investing Delivered directly to your inbox.